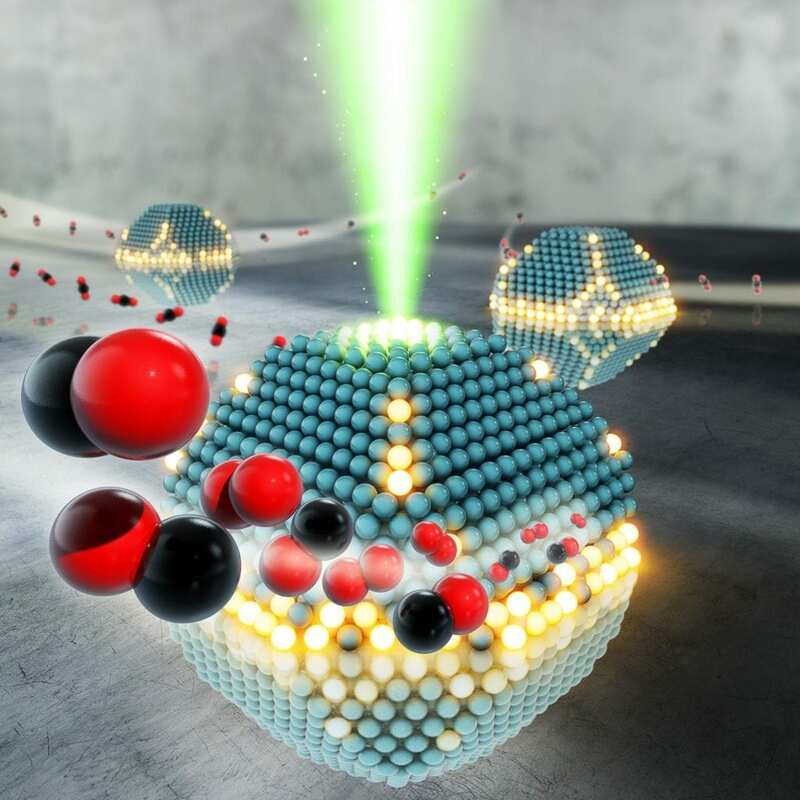 By studying materials down to the atomic level, researchers at Chalmers University of Technology, Sweden, have found a way to make catalysts more efficient and environmentally friendly. The results have been published in Nature Communications. The methods can be used to improve many different types of catalysts. Catalysts are materials which cause or accelerate chemical reactions. For most of us, our first thought is probably of catalytic converters in cars, but catalysts are used in a number of areas of society – it has been estimated that catalysts are used in the manufacture of more than 90 percent of all chemicals and fuels. No matter how they are used, catalysts operate through complex atomic processes. In the new study from Chalmers University of Technology, physics researchers combined two approaches to add a new piece to the catalyst puzzle. They used advanced, high-resolution electron microscopy and new types of computer simulations. "It is fantastic that we have managed to stretch the limits and achieve such precision with electron microscopy. We can see exactly where and how the atoms are arranged in the structure. By having picometre precision – that is, a level of precision down to one hundredths of an atom's diameter – we can eventually improve the material properties and thus the catalytic performance," says Torben Nilsson Pingel, researcher at the Department of Physics at Chalmers and one of the authors of the scientific article. Through this work, he and his colleagues have managed to show that picometre-level changes in atomic spacing in metallic nanoparticles affect catalytic activity. The researchers looked at nanoparticles of platinum using sophisticated electron microscopes in the Chalmers Material Analysis Laboratory. With method development by Andrew Yankovich, the researchers have been able to improve the accuracy and can now even reach sub-picometre precision. Their results now have broad implications. "Our methods are not limited to specific materials but instead based on general principles that can be applied to different catalytic systems. As we can design the materials better, we can get both more energy-efficient catalysts and a cleaner environment," says Eva Olsson, Professor at the Department of Physics at Chalmers. The work was carried out within the framework of the Competence Centre for Catalysis at Chalmers. In order to study how small changes in atomic spacing really affect the catalytic process, Mikkel Jørgensen and Henrik Grönbeck, PhD student and Professor at the Department of Physics respectively, performed advanced computer simulations at the national computing centre, located at Chalmers. Using the information from the microscope, they were able to simulate exactly how the catalytic process is affected by small changes in atomic distances. "We developed a new method for making simulations for catalytic processes on nanoparticles. Since we have been able to use real values in our calculation model, we can see how the reaction can be optimised. Catalysis is an important technology area, so every improvement is a worthwhile advance – both economically and environmentally," says Henrik Grönbeck.